Back cover blurb: TO SOON TO SEE. Polished. Professional. Perfect. Dead. Respected scientist Dr Eleanor Costello is found hanged in her immaculate home: the scene the very picture of a suicide. TOO LATE TO HIDE. DCS Frankie Sheehan is handed the case, and almost immediately spots foul play. Sheehan, a trained profiler, is seeking a murderer with a talent for death. TOO CLOSE TO BREATHE. As Frankie strives to paint a picture of the killer, and their victim, she starts to sense they are part of a larger, darker canvas, on which the lines between the two blur. Too close to Breathe has been described as a fearless, fast paced debut. I am inclined to agree on both counts. Detective Chief Superintendent Frankie Sheehan has just returned to her role after a period of leave, having personally been attacked in a previous case she has been investigating. When the body of Dr. Eleanor Costello is found hanging in her home, the initial reaction is that she has committed suicide. When it transpires that Dr. Costello was murdered, the immediate suspect is her husband, who is coincidentally now missing. A local young woman is then found burning on a bonfire, with a curious piece of evidence that links the two victims unquestioningly. The second victim is discovered in Frankie’s childhood neighbourhood, and the detective faces a difficult time when she must question some of her old neighbours that she grew up trusting beyond any doubt. As the case develops and more suspects are thrown into the mix, Frankie quickly realises that she cannot trust anyone least of all those she thinks she knows. 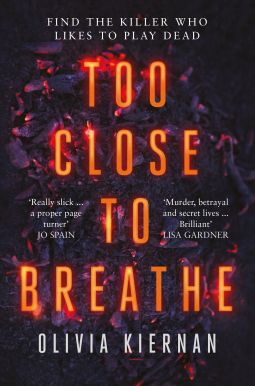 Too Close to Breathe is a thrilling read and I look forward to the authors next! Too close to breathe is available now via Amazon online and all good book shops.